Bryce Canyon National Park is a very popular vacation spot. Why? The view is spectacular, the camping is plentiful and well managed, and there are several easy to moderate hikes making Bryce very family friendly and interactive. Known as hoodoos, these unique rock spires form a spectacular view. 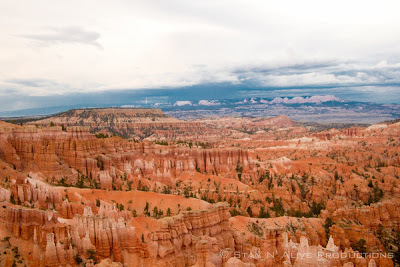 Bryce Canyon offers an extremely dense collection of hoodoos with some spires rising a staggering 10 stories. It is no coincidence that the best lookouts are called Sunrise, Sunset, and Inspiration Point. A few spires standout from the group including our son's favorite--Thor's hammer. Though the views are always breathtaking, at sunrise, sunset, or with a touch of snow are particularly amazing. Bryce has two major campgrounds, both operate on a first come, first serve basis. The inability to reserve a campground in advance can be a little unnerving. We camped during the annual geology festival on a summer weekend and had no problem finding a camping site (the numerous motels were fully booked). I do recommend arriving by 5 at the latest when camping. You want to make sure there will be a space available (and in the extremely unlikely chance that one is not, you have enough time to make another arrangement), you want to have plenty of time to set up camp, and you want to explore the park a little--either at the visitor's center or watching the sunset. I really enjoyed Bryce Canyon's campground. It was close to the main area--general store, lookout point, and visitor's center. It offered showers and clean bathrooms that had flushing toilets, water spouts, and a soaker sink for dishes or laundry. Also, my husband was thoroughly impressed that he had internet access at our camp (I am not sure I see that as a plus). My only real complaint was that the campgrounds were densely packed so there was little to no privacy. Bryce offers several easy and moderate hikes (as well as strenuous hikes for the more adventurous). As a family with both a three-year-old and at a then two-month-old, we hiked the Navajo Loop, a 1.3 mile moderate hike that is extremely well known in the park. Leaving from the Sunset Viewpoint, take the right trail winding through the heart of the hoodoos. At the bottom, walk through a narrow passage as the cliffs rise several stories in the air on both sides (like an open air tunnel). Finally loop back around to the less impressive, but easier side to hike up. This was one of our family's favorite hikes. It changed the experience from looking at a view to interacting with that view. The hike took less than 90 minutes, but I insisted each child carry a bottle of water. Because we are use to high altitudes and a dry climate, we did not need that much water, but we saw several adult hikers that were struggling and looking enviously at our children's water bottles. Bryce also offers other easy hikes including the rim trail, a waterfall hike, and fir forest hikes. Also be sure to check out the visitor's center to learn more about the geology and wildlife of Bryce, watch the short film, and explore the museum.